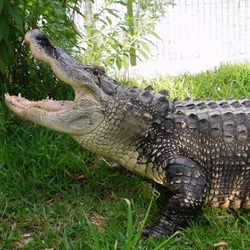 Amos is an American Alligator and the first that ever would call Croc Encounters home. He is not just any ordinary alligator though; he is also the reason the organization was established in 2005. 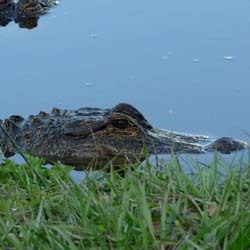 He is one of the largest alligators at the sanctuary and by far the most favored by our group. We even decided to name our first son after him – JOHN AMOS! This distinction is why he appears on the front of our promotional flyers. Amos was originally kept as a pet by a family in Ambridge, PA. After 2.5 years in a small fish tank, Amos was quickly outgrowing his space. That is when his owners decided to place him in the care of those who could accommodate his growing needs. 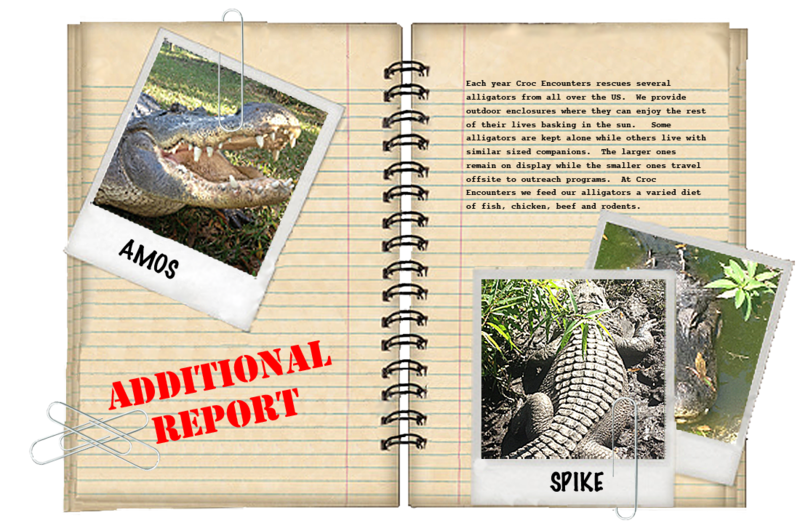 Amos is now over 11 feet long, approximately 600 pounds, and living in a spacious outdoor enclosure. Spike & Bertha are about 30 years old and are a mating pair. Spike is 10 feet and weighs more than 300 pounds and Bertha is about 8 feet in length. They came to us in 2008 from Jungle Bob’s traveling exhibit where they were the highlight of high end parties and once partied with Donald Trump. 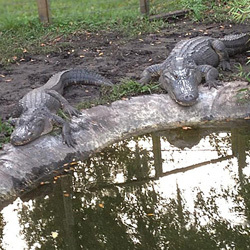 Spike and Bertha share an enclosure at Croc Encounters and still enjoy each other’s company after many long years of living together. Spike continues to travel for events as an animal ambassador. 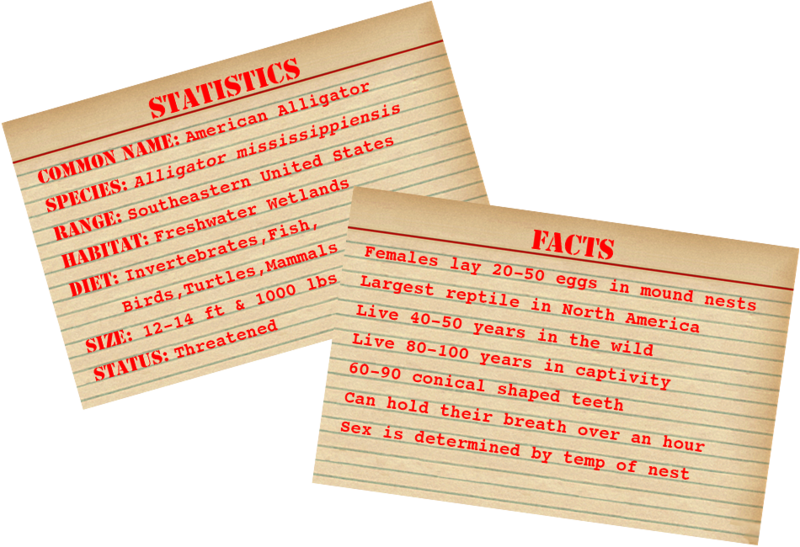 Jojo is a male American Alligator who is approximately 9 feet long. His travel from Buffalo, NY to Tampa in June of 2007 was a media sensation. Even though our organization takes in alligators all the time, from all over the country, Jojo captured the public’s attention. His story was unique. At the time the average length of incoming alligators was between 2-4 feet Long, but Jojo was nearly 8! His owner illegally kept him as a pet in his basement in Buffalo, NY. Because of the owner’s compliance with the Department of Environmental Conservation in New York State, he was not brought up on charges for this offense. Jojo was not kept inhumanely, however he seems to truly enjoy being kept in a large outdoor dirt pond in sunny Florida. He shares this large pond with several other alligators.